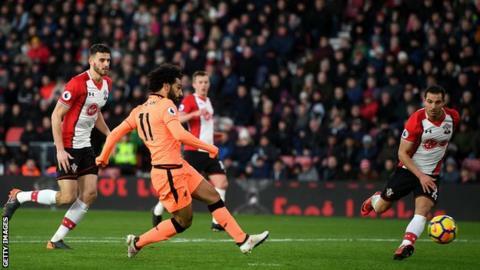 Southampton manager Mauricio Pellegrino claimed the "biggest defeat" his side suffered in their loss to Liverpool was "the character we showed in the second half". It was the Egypt international's 29th goal of the season for the club from 36 appearances. "The second half was really bad. The people see our reaction on the pitch and the players feel the reaction," Pellegrino said. "The anxiety in my players was really high. We understand the emotions of the fans but we have to keep going." The win ensured Liverpool took advantage of Manchester United's 1-0 defeat by Newcastle earlier on Sunday and leapfrogged Tottenham back into third place. Southampton drop into the relegation zone, a point behind Huddersfield who beat Bournemouth 4-1, with further scrutiny of Pellegrino's position likely. Liverpool defender Virgil van Dijk was expected to get a hostile reaction from the Southampton fans on his first return to St Mary's since his move to Anfield, and there were plenty of boos for the Dutchman. The 26-year-old, whose protracted move to the Reds for £75m from Southampton was eventually completed in January after the transfer saga of last summer, more than kept his cool at the heart of Liverpool's defence. His performance was one with which the Southampton fans would have been familiar - towering headers, key interceptions and brave blocks while marshalling the backline. Southampton's Guido Carrillo, left, had five touches inside the penalty area but managed just one shot in total. By comparison, Liverpool winger Sadio Mane's touch map, on the right, shows he got on the ball eight times in the box but produced five shots. Neither forward scored, but it emphasises Carrillo needs more end product. Southampton's victory over West Brom in their previous match ended a run of 12 league matches without a win, but this defeat will have damaged their confidence. A sluggish start and defensive mistakes - with Wesley Hoedt the most culpable - allowed Liverpool to take the lead with a quicksilver counter-attack finished off by Firmino. There was little the hosts could do about Liverpool's second as Firmino's brilliant backheel set up Salah. However, the impressive display by Karius at St Mary's will surely prompt Klopp to rethink his approach, particularly as the European competition represents Liverpool's last hope of a trophy this season. With Liverpool 1-0 up against the Saints the German made two fine saves - narrowing the angle to block a Pierre-Emile Hojbjerg shot and tipping a James Ward-Prowse header over the crossbar - while his quick distribution played a part in Firmino's opening goal. Will Klopp now risk bringing back Mignolet for such an pivotal game on Wednesday? If he does bank on Karius in Portugal, it could well signal the end of Mignolet's Anfield career given the Belgian's desire to play regularly. Liverpool manager Jurgen Klopp: "It was not a brilliant performance, not everything worked quite well, the wind was quite strange. It was difficult circumstances and we did the job. That is very important. "We scored early, got the second goal in the right moment and then controlled the game. "We don't have normal weekends anymore. We want to finish the season top four and we need the points. I don't think nine points from Arsenal is enough to have rest but it is nine points. There is a lot to go for and we will try to carry on like today." Liverpool winger Mohamed Salah: "I said in beginning, I always try to help the team. When you score of course you help the team. "So I'm not surprised, but we need to forget about the past and keep looking forward. We have more league games and the Champions League." Jurgen Klopp gave a hearty pat on the back to Roberto Firmino after he was substituted with 11 minutes left. The Brazilian scored Liverpool's first, produced a brilliant assist for Mohamed Salah for the second and ran tirelessly throughout. Jurgen Klopp has won 50 of his 95 Premier League games in charge (D28 L17) - the ninth fastest manager to reach 50 wins. Salah has scored 19 left-footed goals in the Premier League this term - the joint-most by a player in a single season, alongside Robbie Fowler for Liverpool in 1994-95. Match ends, Southampton 0, Liverpool 2. Second Half ends, Southampton 0, Liverpool 2. Attempt missed. Adam Lallana (Liverpool) left footed shot from the centre of the box is close, but misses to the left. Assisted by Mohamed Salah with a through ball. Substitution, Southampton. Steven Davis replaces Oriol Romeu. Substitution, Liverpool. Adam Lallana replaces Roberto Firmino. Attempt blocked. Roberto Firmino (Liverpool) right footed shot from outside the box is blocked. Attempt missed. Sadio Mané (Liverpool) left footed shot from the centre of the box is close, but misses to the left. Assisted by Roberto Firmino. Attempt blocked. Sadio Mané (Liverpool) right footed shot from the centre of the box is blocked. Assisted by Virgil van Dijk. Attempt saved. Roberto Firmino (Liverpool) right footed shot from the centre of the box is saved in the bottom left corner. Assisted by Sadio Mané. Offside, Southampton. Guido Carrillo tries a through ball, but Dusan Tadic is caught offside. Attempt missed. Emre Can (Liverpool) left footed shot from outside the box is high and wide to the left. Attempt missed. Georginio Wijnaldum (Liverpool) right footed shot from outside the box is high and wide to the right. Assisted by Mohamed Salah. Substitution, Liverpool. James Milner replaces Alex Oxlade-Chamberlain. Attempt missed. Wesley Hoedt (Southampton) left footed shot from the left side of the six yard box is close, but misses to the left. Assisted by James Ward-Prowse with a cross following a set piece situation. Substitution, Southampton. Sofiane Boufal replaces Mario Lemina because of an injury. Attempt missed. Mohamed Salah (Liverpool) left footed shot from the centre of the box is too high. Assisted by Sadio Mané. Attempt blocked. Sadio Mané (Liverpool) right footed shot from the centre of the box is blocked. Assisted by Roberto Firmino. Offside, Southampton. Ryan Bertrand tries a through ball, but Jack Stephens is caught offside.